Make your own professional static & animated cursors for all versions of Windows. Compatible with development industry standards such as Photoshop & Illustrator. Axialis CursorWorkshop is a professional cursor authoring tool which runs under Windows and lets you easily create hi-quality static & animated cursors for Windows applications & websites. With CursorWorkshop make your own hi-quality static & animated cursors for your Windows applications as well as websites. The product generates CUR & ANI files. The new generation of cursors uses variable transparency (alpha channel). This feature permits creating beautiful cursors with smooth borders and shadows. Axialis CursorWorkshop fully support creation of such cursors. Axialis CursorWorkshop allows creating all kind of Static Cursors for Windows (extension CUR). All sizes and color depths are supported up to RGB with alpha channel (for Windows XP to Windows 10). Use the advanced editor to make Animated Cursors (extension ANI). Many features permits creating smooth animated pointers. You can edit each frame in a powerful editor, specify the display delays and see a live preview of your animated cursor while you create it. Built-in Librarian - A powerful Librarian was included in the interface to let you manage your cursor collections with ease. Always visible on screen, it fully supports drag & drop operations and more. Powerful File Explorer - A built-in file explorer permits browsing your disks and find files including images and all files containing cursors. Batch Operations - Sometimes you have a large number of cursors to process. CursorWorkshop includes several batch processing features to create cursors from images, convert image formats, normalize image sizes and more. Cursor Creation from Images: This feature permits creating an cursor with its various image formats in just one click! Image Objects - This exclusive feature permits creating professional-looking cursors in minutes using a few mouse drag & drops. A large quantity of basic image objects are provided in a library. By associating them together you create your own custom cursors. That's easy, fun and powerful! If you work with Adobe products, you'll enjoy CursorWorkshop plug-ins for Illustrator® and Photoshop®. Once installed, the plug-ins will let you transfer images directly from your Adobe application to CursorWorkshop without saving a temporary file. With CursorWorkshop make your own hi-quality Static & Animated cursors for Windows applications and Websites. The new generation of cursors uses variable transparency (alpha channel). This feature permits creating beautiful cursors with smooth borders and shadows. You need a professional tool to create such cursors. Axialis CursorWorkshop has been designed with one goal in mind: "Create Quality Cursors in a Snap". Enjoy the powerful editor which permits creating the various image formats of a cursor from an original drawing without quality loss. The cursors can be created to customize Windows or enhance applications. You can also add your own cursors in your websites. CursorWorkshop™ features a fully integrated workspace. Some cursor tools available on the market are made of several programs resulting in applications which are difficult to use. In CursorWorkshop™, all features are available on screen. This interface lets you be more productive than ever. All the tools are easily available on screen. The application fully supports mouse drag & drop allowing easy and intuitive operations like creating composite cursors from several images. Many features are implemented to help you creating your static cursors in minutes: create all image formats from images in one click, create new formats from existing ones, use of ready-to-use image objects and more. Use the advanced editor to create Animated Cursors (extension ANI). Many features permits to make smooth animated pointers. You can edit each frame in a powerful editor, specify the display delays and see a live preview of your animated cursor while creating it. Create your animated cursors from existing animations: Filmstrips with alpha channel (BMP, PNG, PSD, Jpeg 2000...), Animated GIF, FLI/FLC and more. You can import PSD images with layers from Photoshop® and easily create a multi-resolution cursor from a Photoshop artwork. The use of image objects to create cursors is an exclusive feature of CursorWorkshop. It permits creating professional-looking cursors in minutes using a few mouse drag & drops. The principle is quite simple: A large quantity of basic image and animation objects are provided in a library. By associating them together (on top of each other) you create your own cursor. The images objects, which have been made by professional designers, are provided in 128x128 or 256x256 high-quality PNG format. By adjusting colors, lightness and contrasts, the possibilities are almost infinite. How to use image objects to create cursors? Axialis CursorWortkshop features a powerful feature that permits creating animated cursors from existing animaton files. Autodesk FLI/FLC is the standard animation format used by 3D modeler applications like 3DS Max or Cinema 4D. Create your 3D object, animate it and save it as FLI. Open it in CursorWorkshop and create your ANI file in seconds. Many GIF animations are available on Internet. Axialis CursorWorkshop allows you to open any animated GIF from a web page and easily create an animated cursor from it. 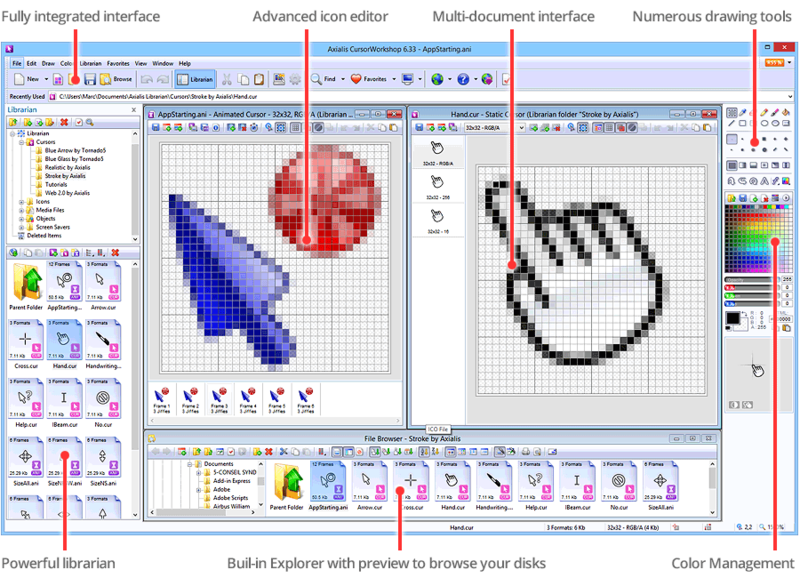 General information on Cursors, cursor creation and use in software projects (4 topics). Batch procedures have been implemented in CursorWorkshop™ to automatically perform operations on a large number of files. For example, you can create cursors from a set of PNG files (CUR/ANI files are created). Use a powerful librarian to easily manage all your media and cursor files. This is an integrated window (which can be hidden) where you can store, move, copy and extract all the files you're using in your work (images, cursors, libraries). Axialis CursorWorkshop is fully compatible with Windows 2000/XP, Windows Vista, Windows 7, Windows 8/8.1 & Windows 10. The application is compiled in 32 bit mode but works perfectly under x64 versions of Windows. This FAQ covers most common support questions related to CursorWorkshop. If you can't find a response in the list below, you can Contact Axialis Team. Axialis CursorWorkshop is a professional cursor authoring tool which permits creating hi-quality static (CUR) and animated (ANI) cursors. It supports all image formats in cursors up to RGB with alpha channel. Customizing Windows - Create your own cursors (animated or static) and save them in the folder Windows\Cursors. Open the Windows® control panel and change the 15 standard cursors accordingly. Add cursors in your applications If you're a developer, you'll appreciate the ability to create your own cursors and include them in your application's resources. The Windows SDK explains in details how to load and use them in your application. Use custom animated cursors in websites If you have a website or a blog, customize your pages with static or animated cursors of your own. Is CursorWorkshop compatible with Windows 10? Yes. Axialis CursorWorkshop (version 6.3 or superior) is fully compatible with Windows 10 (interface, features...). I work with Adobe Photoshop & Illustrator. Can I use them with CursorWorkshop? Yes. You can install plug-ins that will let you transferring an image from Photoshop/Illustrator into CursorWorkshop directly without using a temporary file. Another great feature is the ability to use ready-to-use Photoshop templates. They permit creating icons in different formats using the professional tools of Photoshop, then export the whole cursor in one step into CursorWorkshop. You can even create your own templates. I use to work with transparent PNG images. Can I create cursors from PNG? Yes. You can open any transparent PNG (and even PSD, BMP or GIF) in the product and create a cursor with its different formats in one click. You can also use PNG filmstrips to create animated cursors. You can even create several cursors from a set of PNG images in one batch operation. I'm not good at drawing, can I use CursorWorkshop? Yes. Using ready-to-use image objects, you can create attractive cursors using a few drag & drops. Registered users can download thousands of objects from our website and create professional-looking cursors in a few minutes. Can I distribute my cursors? Yes. CursorWorkshop permits compiling a cursor library (set of cursors on one file) and create a handy installation package. The user will easily install it on his computer. You can even create key-protected installations to sell your cursor sets. Axialis CursorWorkshop is living, so periodically we release new versions. Axialis policy on updates is the clearest possible: FREE UPGRADES FOR LIFE. CursorWorkshop is a professional tool designed to Create, Extract, Convert, Manage and Redistribute Cursors. You create professional looking cursors. You work like a pro, you're seen as a pro. Many easy-to-use features permit to create static and animated cursors from existing images and animations. No complicated settings, no more pixel-by-pixel cursor making. All has been designed to let you be productive and get professional results in minutes (using image objects for instance). but also the look and characteristics you want. This minor release includes various bug fixes and enhancements (enhanced user interface, Illustrator plug-in compatible with CS4...). Registered users can freely upgrade to this latest version using the built-in update feature. New tutorials for CursorWorkshop are available online. Follow easy step-by-step procedures to get the best of CursorWorkshop and create in minutes professional cursors for your applications and websites! Make your own cursors for Windows and web sites: Create professional-looking static and animated cursors to customize mouse pointers in Windows�, applications and web sites. Color formats up to RGB with alpha channel are supported. Create cursors in seconds with Image Objects: This exclusive feature makes you a professional cursor designer. Just by using mouse drag & drops, create hi-quality cursors by assembling ready-to-use objects. New object packs #7 for cursors has been added (423 objects). Create animated cursors from GIF, FLI/FLC, filmstrip animations: Various built-in assistant permits creating animated cursors from existing animation files such as animated GIF, FLI/FLC Autodesk� animations, RGB filmstrips with alpha channel and more. Work efficiently with with industry standards: Use plug-ins for Adobe Photoshop� and Illustrator� and make your cursors in a few clicks.